SocketControlMessage - A Socket control message. A SocketControlMessage is a special-purpose utility message that can be sent to or received from a Socket. These types of messages are often called "ancillary data". The message can represent some sort of special instruction to or information from the socket or can represent a special kind of transfer to the peer (for example, sending a file description over a UNIX socket). 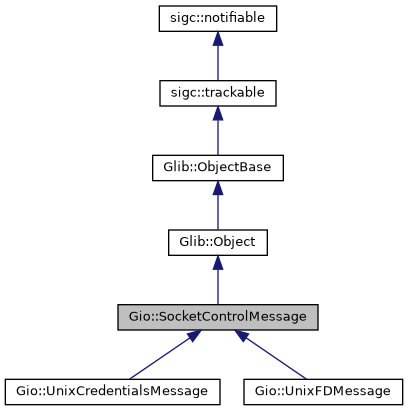 These messages are sent with Gio::Socket::send() and received with Gio::Socket::receive(). To extend the set of control message that can be sent, subclass this class and override the get_size, get_level, get_type and serialize methods. To extend the set of control messages that can be received, subclass this class and implement the deserialize method. Also, make sure your class is registered with the GType typesystem before calling Gio::Socket::receive() to read such a message. Tries to deserialize a socket control message of a given level and type. This will ask all known (to GType) subclasses of SocketControlMessage if they can understand this kind of message and if so deserialize it into a SocketControlMessage. If there is no implementation for this kind of control message, nullptr will be returned. type A socket control message type for the given level. size The size of the data in bytes. data Pointer to the message data. The deserialized message or nullptr. Returns the "level" (i.e. the originating protocol) of the control message. An integer describing the level. Returns the protocol specific type of the control message. For instance, for UNIX fd passing this would be SCM_RIGHTS. An integer describing the type of control message. Returns the space required for the control message, not including headers or alignment. The number of bytes required. Converts the data in the message to bytes placed in the message. data is guaranteed to have enough space to fit the size returned by g_socket_control_message_get_size() on this object. data A buffer to write data to.